Have you ever wondered if your strange collection of skills and interests could be woven together to build a profitable business? If you have, you’ll love today’s Hero’s Journey article. Lauren Pawell is a rare breed: she has a background in development and marketing. That’s a combination you don’t see every day! Some people might have encouraged Lauren to choose one field or the other. But she persisted and has built a business that artfully combines her many passions. 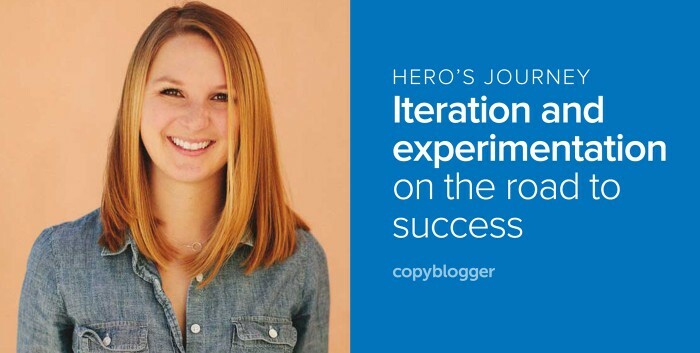 Lauren’s story is this month’s Hero’s Journey feature. We’re tapping the collective wisdom of our community members to bring you reports from the front lines of the content marketing world. See all the Hero’s Journey posts here. Read on as Lauren shares what she’s learned over the years and how you can use her hard-earned wisdom in your own business. Lauren Pawell: What sets Bixa Media apart is my background in both development and marketing. This allows me to sit at the intersection of business, technology and design. We help entrepreneurs turn their WordPress and Shopify websites into revenue-generating powerhouses. We do that through a mixture of website design and development, content marketing, search engine optimization, paid advertising, and online reputation management. Not only can we write killer copy, but we can also evaluate your technology options, decide which is best for your needs, and build everything for you, while keeping your business objectives at the forefront of the process. I find our clients really value having a partner who can help them from A to Z. Perhaps more importantly, we’re able to tell our clients where not to waste their dollars and effort, and where to focus their resources. Even if this doesn’t always match what a client had in mind, our honest feedback resonates with business owners. 1:1 online marketing services: For medium-sized businesses who are looking to outsource their online marketing, we offer a variety of services designed to amplify their online exposure and generate more customers. DIY programs: For small businesses or solopreneurs who don’t yet have the resources to outsource their marketing, we offer educational marketing programs through Websites That Generate. My business is primarily online, although I do plenty of networking offline — I find they go hand-in-hand. The offline contact tends to tip the scale in our favor, especially when it comes to securing large contracts. Lauren Pawell: I started my business for two reasons. First and foremost, after working in marketing overseas for a few years, I saw so many small-to-medium-sized businesses with a wealth of online opportunity at their fingertips. But they just didn’t have the right guidance. As a result, they were spinning their wheels in so many different directions with little-to-no impact. I wanted to help them pick that low-hanging digital fruit, so that they could continue to grow their businesses and entrepreneurial dreams. So, in 2011, I moved back to the United States, booked my first client at a friend’s birthday party (notice that offline touchpoint! ), and haven’t looked back since. The best part of that story? Our first client still works with us today and has gone from a one-man business to a 20+ person company. Now that is why I started Bixa! I don’t share the second reason with many people, but I feel it will resonate with the Copyblogger audience. In 2011, I had been through one-too-many bad bosses and was tired of not being in charge of my own destiny, from both a personal and career standpoint. That freedom I craved drove me to start my own company. My driving motivation is to help other entrepreneurial spirits achieve the same freedom I have. Lauren Pawell: Converting cold traffic into qualified leads is a finicky beast, especially when it comes to selling online education. It’s not hard to understand why — cold traffic doesn’t immediately pull out their wallets. It took quite a bit of trial and error to dial in our lead-nurturing process, but we did it. A new email subscriber generated from a Facebook ad was not likely to immediately jump up and buy our program. However, when we started to establish trust and demonstrate our authority through a few different mediums, we were far more successful. First, we run the new subscriber through a long welcome series over email. We send them 7 emails over 20 days, all of which include a lot of copy. It helps us weed out unqualified leads. While in many approaches we did not want a lot of unsubscribes, in this case, we welcome them. It allows us to filter out anyone who doesn’t immediately love us. There we share weekly educational content over video and give 1:1 feedback, similar to what they would experience in our course. This also helps establish us as a trusted and authoritative figure. This helps the subscriber better understand their problem and the solution they need to transform their situation. Last, but not least, we sell our program through email during specific times of the year, and are available on live chat to answer any questions the prospects have. (This, again, is similar to our course experience). Some may say we give away too much for free, but I find this really helps us find great students. Plus, it allows our Facebook ad spend to generate far more ROI. When we didn’t follow this solution and jumped straight from Facebook ads to a webinar to a sales email, our conversion rates weren’t great. Now, they are stellar. So, if you feel like you are wasting dollars on Facebook ad spend, consider the rest of your funnel. Now that we know what works, it’s far easier to justify scaling up our marketing spend. Lauren Pawell: In Q2 of this year, I decided to test the idea of online education programs. I wanted to be less reliant on 1:1 client work, which can be unpredictable. And I wanted to help all the entrepreneurs we were turning away due to a full calendar on our end, and limited resources on their end. To validate the idea, we began being incredibly transparent about our marketing tactics. We educated our audience through a number of mediums, notably: email, online webinars, and a private Facebook community. This effort has been quite successful. We recently presold an educational course (before it was created) that our audience was begging for. By validating an idea through free content first, we were then able to dedicate the resources to creating paid educational programs. A course takes a lot of front-loaded work, especially content creation. The last thing I wanted to do was create a program no one wanted. As an added benefit of this education-first approach, when 1:1 prospects come through the door, they are already sold on working with us. Because they already understand the “why” behind our recommendations, the selling is 90 percent done by the time we write a proposal. I also happen to be a new Copyblogger Certified Content Marketer. And I’m attending the upcoming Digital Commerce Summit in Denver. So, needless to say, I’m a Rainmaker Digital diehard! Lauren Pawell: In the final quarter of 2016, we’ll focus on refining our sales funnels and scaling up our DIY programs. Our educational courses at Websites That Generate haven’t been marketed on our website, or really even promoted outside of email. That’s because I wanted to run a few groups of people through our programs to ensure we really dialed them in. Now that we’ve gotten the process down, we’re ready to scale up. The first step in that process requires some adjustments to our sales funnel. Then, we can scale up our lead generation through Facebook ads. Lauren Pawell: If, like me, you’re considering creating an educational program to complement your 1:1 services, I highly recommend the Rainmaker Platform. All of the technology was so easy to set up, allowing us to focus most of our effort on the course creation and marketing. When it comes to selling a course and serving your students, the less you have to worry about the technology, the better. 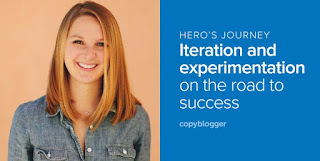 Thanks to Lauren for appearing in our Hero’s Journey series. Do you have questions for her? Ask them in the comments.